Texting while driving occurs when the driver is writing, sending, or reading text messages or emails, or making other similar use of the internet on a mobile device, while operating a motor vehicle, whether it is car, truck or train. The texting while driving, according to experts and authorities is risky and dangerous. Specifically, negative effects were seen in detecting and responding correctly to road signs, detecting hazards, time spent with eyes off the road, and (only for sending text messages) lateral position. Texting while driving leads to increased distraction behind the wheel. 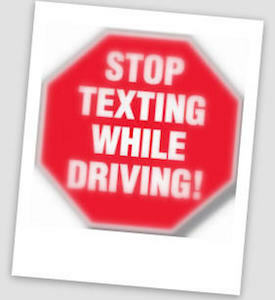 A study by the AAA discovered that 46% of teens admitted to being distracted behind the wheel due to texting. Studies have repeatedly shown that talking and texting on cell phones is a major cause of distracted driving, yet some people continue to put others at serious risk through this dangerous behavior. When these people cause accidents, they can be held accountable. At Dr Shezad Malik Law Firm, experienced Dallas Fort Worth cell phone distraction related accident lawyer Shezad Malik and the rest of our team are dedicated to winning fair compensation for the victims of distracted driving. Was the Driver who hit You on the Phone Talking or Texting While Driving? Texting while driving is even more dangerous than talking while driving, which is why the federal government has made it illegal for commercial truck drivers. Both talking and texting have an impact on safety that is comparable to drunk drivers. Many states are now beginning to step in and restrict or ban these dangerous behaviors. If you have been injured in an accident with a distracted texting driver, our attorneys will move quickly to obtain that person's cell phone records and other evidence so we can prove — to a jury if necessary — that his or her irresponsible behavior was the cause of your injuries. AREAS OF PRACTICE: Our Dallas Fort Worth Personal Injury and Wrongful Death Attorneys and Lawyers have extensive experience in the areas of: car and truck accident, sexual abuse, tractor trailer and commercial vehicle litigation, wrongful death, serious auto accidents and car wrecks, bus accidents, dog bites, product liability, brain/head injuries, burn and electrical injuries, spinal cord injuries, premises liability/slip and falls, negligent security, and many other types of personal injury cases.